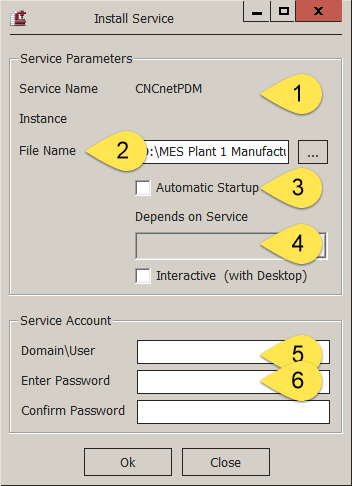 This section shows the steps to install and start CNCnetPDM as a background service. CNCnetPDM is able to and, in a production environment, usually runs as a windows background service. To install and start the service proceed as follows. 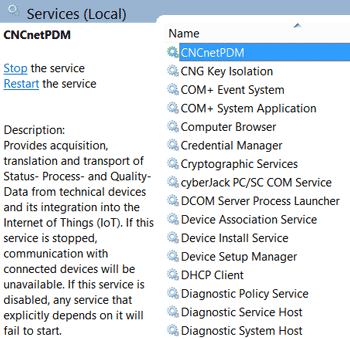 If you simply double click CNCnetPDM.exe and click on button ‘Install’ in section ‘Service’ an additional dialog with various service parameters opens. However, if you click on ok on most recent MS Windows Operating Systems you most likely will see a popup window with an ‘Access is denied’ message. This is because your user account does not have the appropriate rights to install a background service. Section ‘Service Account’ contains information about the user account the service runs under. If nothing is entered here the service runs under the ‘Local System’ account which is default for most Windows background services. Enter information here only if you’d like to run the service under a different account. Please note that this account has to have the appropriate permissions to run a service. Usually no data has to be entered here.